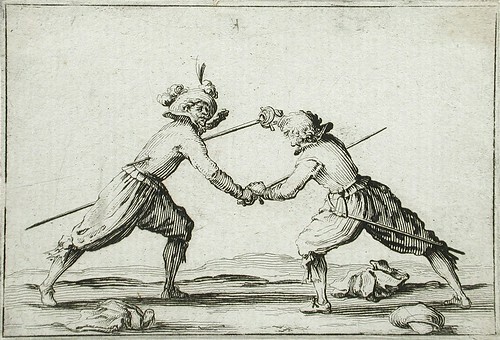 Just a flesh wound? Scan by fae on Flickr. Revenues are draining out of the PC business like blood from someone who has come off worse in a swordfight in Game Of Thrones. According to the data I’ve collected from the top four Windows PC OEMs which publish financial data – HP, Lenovo, Asus and Acer (but not Dell, because it has been a private company since September 2013) – there’s a steady drop in the total revenues in the Windows PC market. An update: I was asked to show the revenues for the companies. This comes from their company reports, and from IDC’s figures for PCs shipped. Note that IDC excludes Chromebooks and 2-in-1s; that would favour companies which sell either of those devices (as they get the revenue, but it doesn’t count against PCs shipped). Apple however doesn’t call its 2-in-1 a PC – it’s an iPad, and it puts it in that category (which isn’t measured here). Note how Acer’s figure is falling faster than the overall trend. What’s noticeable there is how Acer’s revenue per PC keeps sliding. Asus, meanwhile, has staged a recovery, along with HP. And Apple sails above the lot. If you look at operating profits for the Windows PC OEMs, the picture is again a little clouded, but there’s a clear general trend over the past couple of years: after heaving themselves out of a bad period in mid-2012 to the end of 2013, there was a sudden uptick in their fortunes in 2014 when the end of Windows XP heralded a burst of spending by corporations on new PCs. Since then, though, decline has set in again. Note this is a weighted average: Lenovo sells more machines, and is more profitable, so that pulls up the average. That might look healthy enough, but in fact the operating margins vary from around 5% (Lenovo) and 4% (HP Inc) to 1.3% (Acer). If you look further down the chain, to companies like Fujitsu and Toshiba, their PC businesses are shrinking in size and making operating losses. I’d be surprised if Samsung is doing better than breaking even on its much-reduced PC business, which has roughly halved in revenue since the end of 2014 to just under $600m per quarter; at the average price of PCs, that’s about 1.2m units per quarter. We don’t know Apple’s operating profits on PCs, but historically the figure has been just under 19% of PC revenues – which means that it has an operating margin roughly four times higher than any rival, while its average selling price (ASP) of $1,265 is more than double the $490 of the big players. 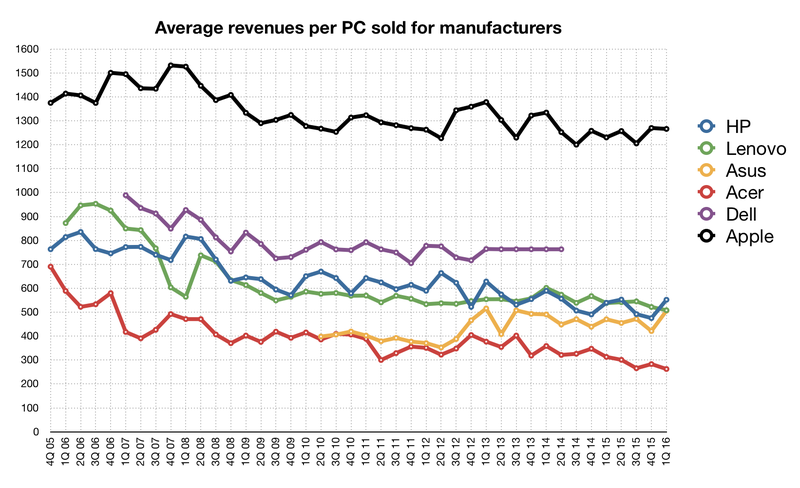 On those figures, Apple sweeps up roughly half of all the profits in the PC industry. But now change – more precisely, disruption – is on the horizon with the advent of Chromebooks capable of running Android apps – which will, crucially, include Microsoft Office. Credit to Tom Warren for spotting the story: Chromebooks outsold Macs for the first time in the US in the first quarter of 2016, shifting an estimated 2m against 1.76m Macs. It’s an important story, and one which I’ve been expecting for a long time: Chromebooks are beginning their low-end disruption of the PC market. This can only grow. The important question now is, who loses and who gains? Sure, you can argue with the numbers – Apple doesn’t break down shipments for the US, and IDC has in the past got its totals wonky for the worldwide and US figures. But what’s mostly put some peoples’ noses out of joint about this data point is that Chromebook sales have been compared to Apple’s. That’s Google and Apple. The big rivalry in tech. That’s because the only other two candidates for the “sold more than” metric by IDC’s data were Acer (0.71m shipped in the US) and Lenovo (1.92m in the US). But the trouble with doing that – “Chromebooks outsold Acer” or “Chromebooks outsold Lenovo” – is that (a) nobody cares (b) both Acer and Lenovo sell Chromebooks, so they’d be the ones outselling themselves. Use “Apple” in the headline, though, and everyone’s happy: Apple doesn’t sell Chromebooks, and it’s a savoury tale. But this an important story of low-end disruption. Clayton Christensen, who first formulated the theory, should be happy. Low-end disruption is the idea that long-developed, complex, expensive products are replaced at the low end by cheaper good-enough products which, while they can’t do everything the complex expensive ones can, are still fine for a segment of the market. Then the low-end products improve, as technology tends to, until they serve more and more of the market, driving the complex products further upmarket (to retain revenue as unit sales shrink). Eventually, in the limit, the high-end makers give up. When Google announced the Chromebook in June 2011, I was agog. The potential for disruption was obvious – though at the time I thought it would be more popular with enterprises than education or consumers. On that basis, I thought they could chew away billions of dollars of Microsoft revenues and profits. That didn’t happen, and the reasons why eluded me for some time, but it boiled down to a few things: enterprises often needed specific Windows-based apps; consumers were pretty happy buying Windows machines (or tablets, as happened with greater eagerness for a few years); schools wanted to experiment with tablets. Also, Chromebooks didn’t have Microsoft Office – which many businesses, and consumers, still see as essential to getting stuff done. Furthermore, ChromeOS was essentially a browser, and people need more than just a browser to do everything; witness the popularity of apps on smartphones and tablets. But now, with the impending arrival of Chromebooks that can run Office, the stage is set for low-end disruption to tear through the PC market, which is already struggling with the effects of consumers turning to tablets and smartphones in preference to PC upgrades. Just as important is that PC OEMs may actually have good reasons to make Chromebooks in preference to Windows PCs. The research company Gartner recently pointed out that there are only two properly profitable niches in Windows PCs: high-end ultramobiles, which is the only segment showing revenue growth, and gaming PCs, which are tricked out with high-spec components (especially GPUs). For the rest, it’s a depressing slide towards the bottom. Among the fixed costs for those PC OEMs is the Windows licence. But what if you could remove the cost of Windows from your bill of materials? The machine at once becomes more profitable. Though there is a fly in the ointment: to work well with Android apps, it will need a touchscreen, which is an expensive item. Even so, you can see how a PC OEM trying to shore up their revenues and profits – which are increasingly hard to come by – would look for any new space they can. Chromebooks definitely look like that space. However, I don’t expect it to disrupt Apple yet. The company most at risk from this is still Microsoft, because if people choose to use Chromebooks, it’s usually going to be in preference to Windows PCs. Apple remains the choice of the high-paying buyer – the segment, as noted above, which stays resistant for the longest. The other question is which PC OEMs will stand to benefit most, or lose most, from the growth in Chromebooks. I think those which have high cost efficiencies, or can price higher based on brand, will benefit. Samsung has good cost efficiencies (it makes a lot of the stuff) even though its brand is weak in PCs, so could do well. Acer and Asus? Hard to say. HP makes money selling cheap PCs with value-added Microsoft deals, but could switch to doing cloud deals around ChromeOS. Lenovo, though, might have the most to lose if it can’t keep squeezing extra margin from selling Windows. Ironically, there’s one potential barrier. It’s the most widely used Windows desktop program that isn’t available for Chromebooks: Apple’s iTunes. Given that tens of millions of people, at a conservative estimate, and perhaps more than 100 million still rely on iTunes to organise their music, and to sync their iPhones and iPads, the absence of iTunes for ChromeOS or Android could turn out to be a stumbling block on the road to total Windows disruption. (Notice how the most eager adopters of Chromebooks so far have been those which don’t need to manage iTunes. And Apple Music on Android is an app for the paid streaming service, not the music-you-own organiser.) It certainly didn’t help WindowsRT that iTunes wasn’t available for it. Sure, I know and you know that people can and have been managing their iPhones and iPads and music and app libraries since 2011 using iCloud, without resource to iTunes. Don’t discount it, though. The generation which might find it easiest to live without is the first-time PC buyer. But even more problematic for Microsoft is that they just don’t seem to be buying PCs at all. It’s hard to see this Game Of Thrones ending well for Windows. This entry was posted in analysis and tagged apple, microsoft, pc, windows by charlesarthur. Bookmark the permalink. Been a big Chromebook fan since 2013, and been playing around with the developer version of Android apps on the Asus since it was released on Friday. I’m more convinced of ever now that it *could* be the game-changer for Chromebook. It does for a touch screen Chromebook what “modern UI/Metro” apps were supposed to do for Windows 8 if it hadn’t have been for no bugger actually developing them. Hi Charles, can you pls share the updated avg revenue per PC sold for the manufacturers (refresh of your graph)? Seems like the market avg ASPs have been crashing since the advent of Chromebooks. It’ll be a good data point to understand if CBs & Smartphones have an impact.